With Special Features, including "Bill Belichick Revealed" & "Gronkology" & much more! Los Angeles, CA (February 19, 2015) – In a game for the ages, on February 1st, 2015, the New England Patriots, led by Tom Brady and Bill Belichick, took on the reigning champion Seattle Seahawks in Super Bowl XLIX. With time winding down in the final minute of this epic matchup, New England's championship hopes again seemed to be dashed after another late-game circus catch, this time by Seattle wide receiver Jermaine Kearse. With Seattle just a yard away from repeating as Super Bowl Champions, an undrafted rookie free agent, Malcolm Butler, jumped the route to wrangle Russell Wilson's pass away from the receiver and sent the Patriots to their fourth Super Bowl victory since 2001. After leading his team to 14 unanswered points, Tom Brady was named MVP and the celebration officially began. Just one month following The Big Game, Cinedigm (NASDAQ: CIDM), the National Football League (NFL) and NFL Films will team up to bring NFL fans the most anticipated sports film of the year when NFL Super Bowl Champions XLIX: New England Patriots is made available on Blu-Ray™, DVD and Digital Download on March 3, 2015. 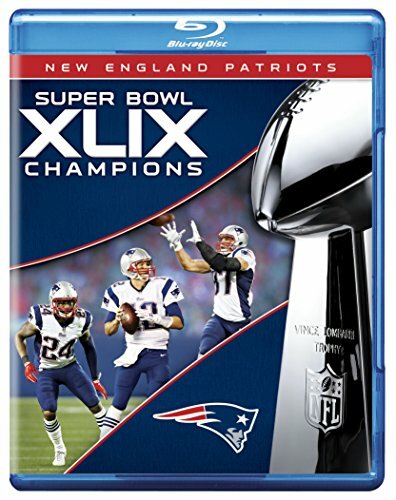 Super Bowl XLIX Champions: New England Patriots will be offered on Blu-Ray (BD) for $34.93 SRP and DVD for $24.99 SRP. With its award-winning video and photography, NFL Films captures everything from the non-stop action-packed season, playoff and Super Bowl XLIX highlights and behind-the-scenes footage every die-hard fan desires. NFL Super Bowl Champions XLIX: New England Patriots will allow Pats Nation to relive the team's incredible journey from the beginning of the regular season, through the playoffs and culminating with their storied Super Bowl victory in Arizona. "This matchup had us on the edge of our seats and we are thrilled to commemorate the Patriots' impressive season resulting in their fourth Super Bowl Championship," said Norbert Hudak, Senior Vice President, Marketing and Brand Management Cinedigm. "As if the last three minutes of the Super Bowl isn't enough, we'll take a deep dive into the Pats' incredible journey from training camp to the championship parade in Super Bowl XLIX Champions: New England Patriots." Since 1965, NFL Films has revolutionized the way America watches football and set the standard in sports filmmaking. Exclusive all-access sound, stunning cinematography, stirring orchestral music and poignant storytelling are the trademarks of NFL Films. Winner of 119 Emmy® awards, the production division of the National Football League is widely recognized as the most honored filmmaker in sports. Cinedigm is a leading independent content distributor in the United States, with direct relationships with over 60,000 physical retail storefronts and digital platforms, including Wal-Mart, Target, iTunes, Netflix, and Amazon, as well as the national Video on Demand platform on cable television. The company's library of over 52,000 films and TV episodes encompasses award-winning documentaries from Docurama Films®, next-gen Indies from Flatiron Film Company®, acclaimed independent films and festival picks through partnerships with the Sundance Institute and Tribeca Films and a wide range of content from brand name suppliers, including National Geographic, Discovery, Scholastic, NFL, Shout Factory, Hallmark, Jim Henson and more. Additionally, given Cinedigm's infrastructure, technology, content and distribution expertise, the company has rapidly become a leader in the quickly evolving over-the-top digital network business. Cinedigm's first channel, DOCURAMA, launched in May 2014, and is currently available on over 200 million consumer devices including ioS, Roku, Xbox and Samsung, with additional platforms currently being rolled out. Earlier this year, Cinedigm also announced plans for CONtv, a Comic Con branded channel, in partnership with WIZARD WORLD, for launch in Q1 2015. The Company also announced its third OTT channel via a partnership with The Dove Foundation. DOVE MOVIE CHANNEL will be a digital streaming subscription service targeted to families and kids seeking high quality and family friendly content approved by Dove. Cinedigm™ and Cinedigm Digital Cinema Corp™ are trademarks of Cinedigm Digital Cinema Corp www.cinedigm.com.